VeloViewer is a UK-based site set up by Ben Lowe. 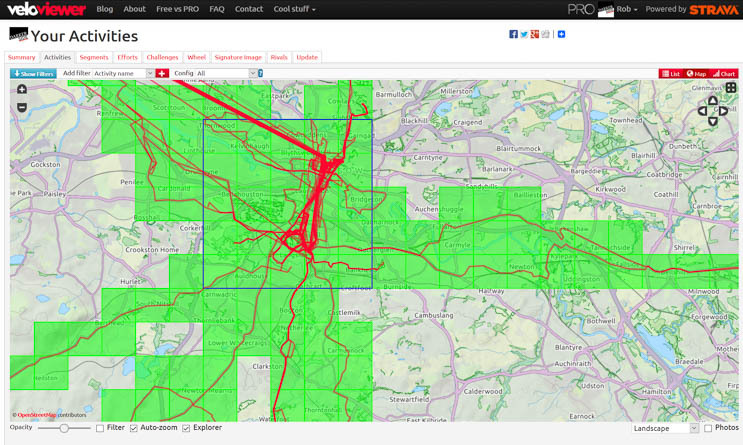 For nine quid a year, you can view all your Strava data in a massive (and ever increasing) variety of ways. If you’re at all interested in digging in to the numbers that your GPS device spits out, then I can heartily recommend it (and will be doing a full review pretty shortly). One of the features available is the map explorer, where you can see how many 1km (ish) square map grids you’ve been through (filtered, if desired, by the date, bike you used, whether you ran or cycled, etc). 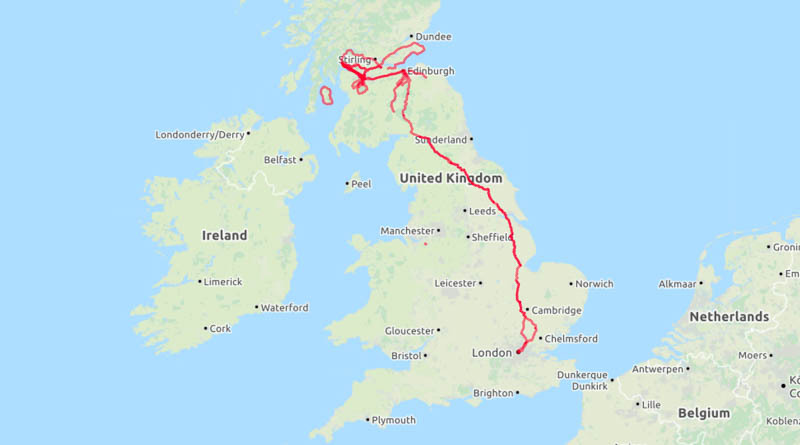 It’s a neat little feature, but apart from reveling in how long that London-Edinburgh-London ride really was, I didn’t do much with it. The VeloViewer summary page now includes an explorer score, including the maximum grid size where I’ve visited every tile within. I’m only a humble 5×5 at the moment, but 7×7 seems easily achievable. This is the kind of addictive little game that I really enjoy (a leaderboard is coming, apparently), with the additional bonus that it forces me to plan new routes rather than stomping over the same old roads again and again. I shared my fears with @hankchief on Twitter that those of us in Scotland are likely to be handicapped by a lower road-to-landmass ratio than the rest of the UK. There will be many 1km squares of land that simply don’t have a road (or may be under water…). 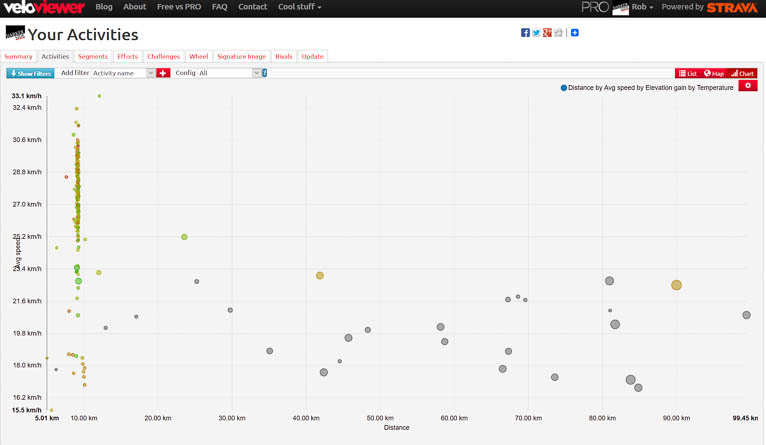 However, Strava is happy to track pretty much any form of self propulsion you can imagine. 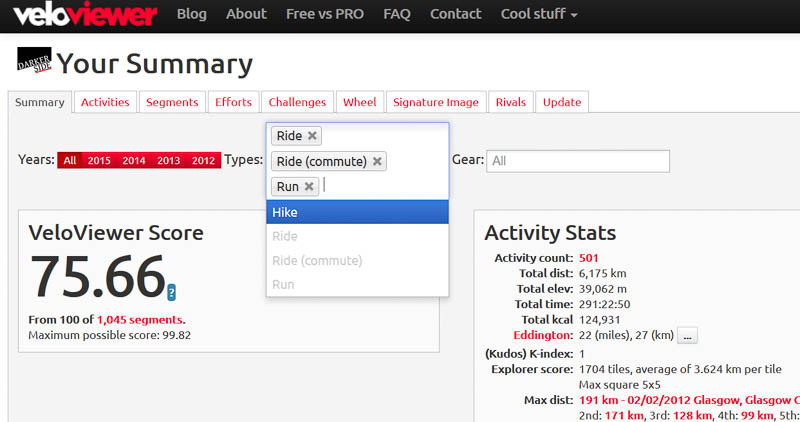 The available activity types are: cycling, running, swimming, hike, walk, four types of skiing, canoeing, kayaking, rowing, two types of skating, three types of surfing, snowboarding, showshoeing, rock climbing, stand up paddling, and “elliptical”, whatever that is. Plus a bunch of other stuff that doesn’t involve moving around outside. 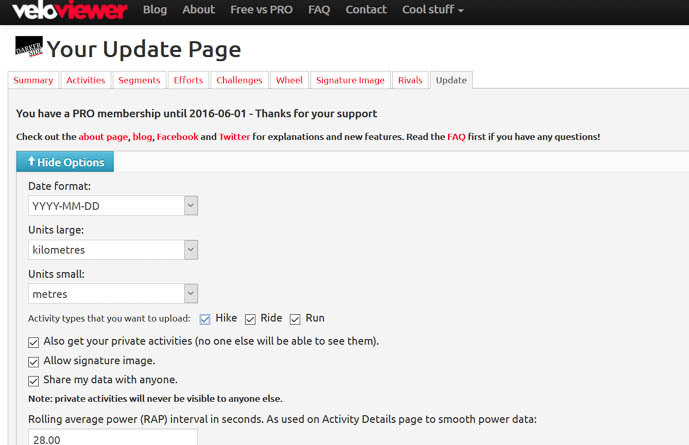 Ben confirmed on Twitter than VeloViewer will import every activity you’ve got on Strava and the filter options automatically expand depending on what activity types you’ve got selected. @Darkerside @hank_chief yep, all types can come in. Make sure the types you want are checked in your Options on your Update page. And as a final step, I can nip across to Activities, select “Map”, filter on “hike” only, check the “explorer” option to overlay the map grid squares, and lo! my cheeky 900m walk has already grabbed me two grid squares. This is cool for a couple of reasons. Not least, I can now use hikes, walks and (if I get really desperate) a bit of coastal kayaking to capture those elusive missing grid squares. However, this ability for VeloViewer to handle anything you dump into Strava opens loads of possibilities. Maybe you’re Monro-bagging. If you upload your GPS tracks to Strava afterwards, VeloViewer will give you an unbelievably detailed breakdown of your efforts, including some nice map overlays showing which distant outcrops of rock you’ve dragged your fatigued form over. Maybe you’re a competitive kayaker and want to measure paddling cadence. Given most running watches can estimate running cadence by arm movement I’d be amazed if paddle strokes didn’t also register. VeloViewer then gives you change over time, or perhaps a graph of cadence vs heart rate vs distance, or the number of hours you spend every Monday on the river. Mountain rescue team, perhaps looking to keep a running total of the meters climbed in a month to add some extra detail to fundraising efforts? Paraglider, desperate to know how long you’ve been in the air for? Or maybe you just want to quickly throw up a graph showing distance of ride against average speed. With the size of the marker showing elevation gain. And the colour being average air temperature. 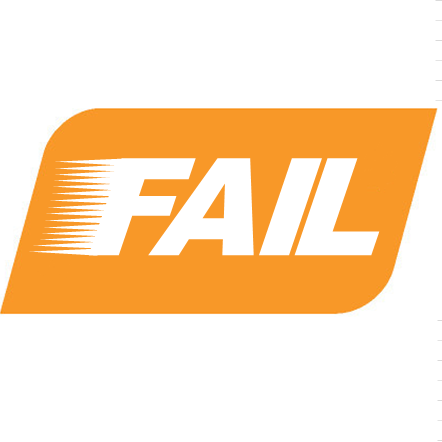 But only for rides between the 10 June 2013 and the 21 Jan 2015. Where I was on the MetaBike. 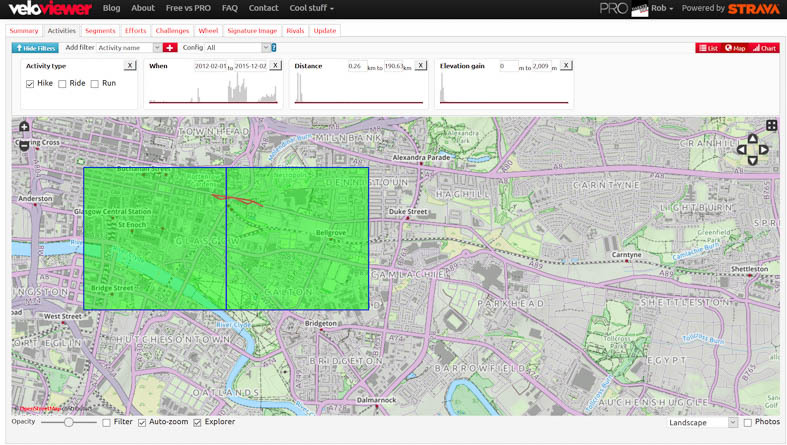 Not very exciting for GPS Tracking ! Does doing the ‘Grossglocknerhochalpenstrasse’ in my local spinning studio work ? Ah, if it’s something stationary inside a gym it’s not for me! Google is letting me down on “Grossglocknerhochalpenstrasse”, but assuming it’s linked to “the Grossglockner High Alpine Road [which is] the highest surfaced mountain pass road in Austria”, then I reckon whatever you’re doing to it, it probably counts!